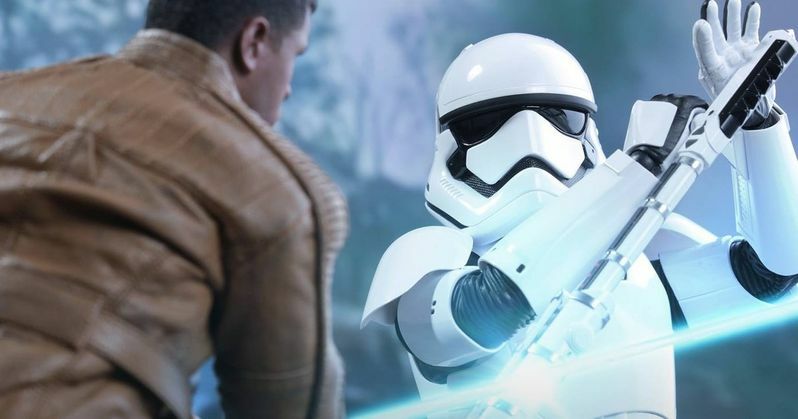 Star Wars: The Force Awakens TR-8R Stormtrooper Origins Explained? Over the weekend, one spin-happy Stormtrooper was declared the king of the Internet, especially when it comes to new Star Wars: The Force Awakens characters. The First Order soldier only has a minor cameo in the movie, but he is one of two central characters in a key action sequence that pits John Boyega's AWOL Stormtrooper Finn against one of his old comrades who calls the former warrior out as a 'Traitor'. This Z6 baton-wielding Stormtrooper has since been dubbed TR-8R and has become the subject of many memes. Now, we learn more about his backstory in a tie-in novel. In Before the Awakening, a new book that is part of the Journey to Star Wars: The Force Awakens novel series, we get what appears to be a backstory for everyone's favorite new Stormtrooper. In these pages written by Greg Rucka, we learn that Finn was part of a four-man fire-team. He grew up with this special squad, which featured himself (FN-2187) along with Stormtroopers FN-2199, FN-2000 and FN- 2003. These three other soldiers have earned the nicknames Nines, Zero and Slip. While the first two names are in direct relation to the First Order codes given, Slip has earned his nickname for slipping up once to often. It is revealed in the book that Finn is ranked in the top 1 percent of his class at the First Order's Stormtrooper Academy. Captain Phasma has long had her eye on Finn, and is worried that his loyalty to his teammates may get in the way of accomplishing his mission objectives. Which, we see in the movie, is proven to be true during his first day on the battlefield. Phasma notices that Finn likes to cover for Slip's many unfortunate accidents, and demands that he stop coddling his comrade. In Star Wars: The Force Awakens, it is the dying Slip who leaves a bloody handprint on Finn's helmet during the opening raid on Lor San Tekka's small Jakku village at Kelvin Ravine. This is confirmed in the Visual Dictionary that was released in conjunction with the movie. It is Slip's death that pushes Finn over the edge, causing him to become a deserter. TR-8R is believed to be either FN-2199 or FN-2000, as the fight between Finn and the Baton brandishing Trooper is quite personal. Though, TR-8R's code name has not been confirmed at this time. TR-8R has no problem identifying Finn without his mask on. And it's likely that TR-8R already has an official name, though this Internet-appointed nickname certainly has stuck. While this gives us the backstory on TR-8R, it sounds like LucasFilm and Disney have not decided on the Stormtrooper's true place in this saga, and it sounds like he may not have died after being hit by Han Solo's blaster. When asked by /film about TR-8R's true identity, Lucasfilm story group executive Pablo Hidalgo had this to say, indicating that fan fervor might truly make this character the next Boba Fett. "I'll have to get back to you on that. Hold that thought." A new edition of Star Wars Minute, which you can watch in the embed below, goes onto further theorize the true origins of the riot control Stormtrooper with the lightsaber-proof Z6 baton. We've also included some of the other videos and memes that have popped up since Saturday. The character even has his own Twitter account now at @officialTR_8R. We even have a new DIY video that shows you how to make your own Z6 Riot Baton. What do you think? Is they guy catching too much hype? Or does he deserve to be the new Boba Fett? Will he live only to be killed off by Captain Phasma in Star Wars: Episode VIII? We'll have to wait and see.